I love, love, love cupcakes primarily because they are little personal cakes. I like how cute they look. I like the portion control. I like that I can eat a whole cake and not feel guilty. 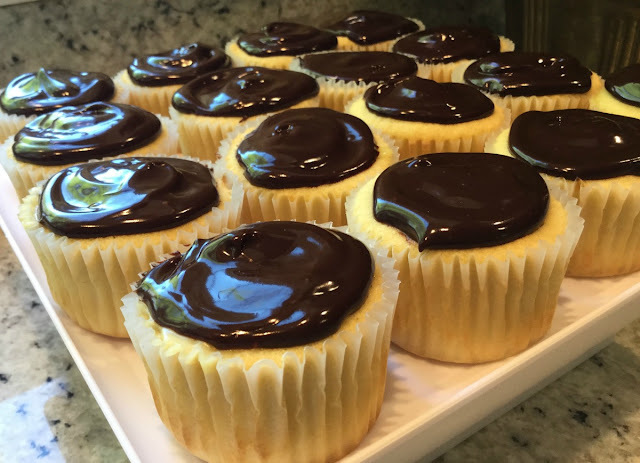 These Boston cream cupcakes are the result of my quest to turn Boston Cream Pie, one of Hubby's favorite desserts, into portion controlled, individual servings. 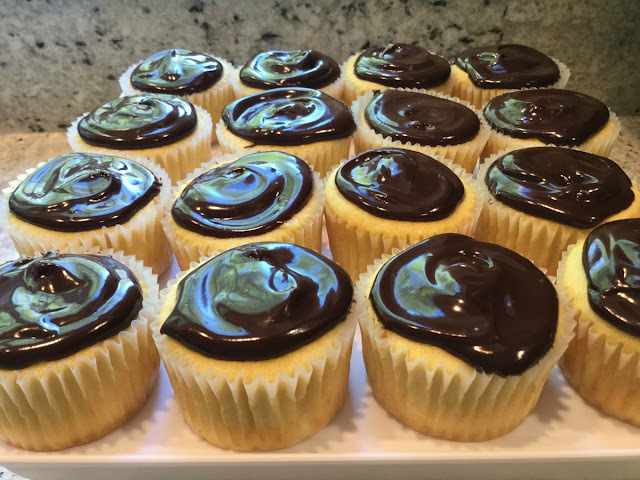 Boston Cream Cupcakes turn Boston Cream Pie into a little less of a guilty pleasure. Don't they look yummy? I love how glossy the chocolate ganache topping looks! 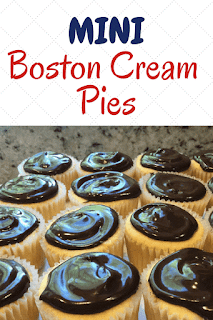 I've always thought of Boston Cream Pie as a fussy dessert to make. I don't like fussy desserts or any fussy recipes, for that matter. In reality, the recipe is pretty straightforward and while the cupcakes are made in three steps, each step is fairly simple. You can even spread making these cupcakes over a couple of days if you like. First, you will make the pastry cream because it must chill for at least two hours. While the pastry cream is chilling, bake the cupcakes and let them cool. Last, you'll make the chocolate ganache topping. Bring the heavy cream to a simmer in a medium saucepan over medium heat. While the cream is heating, whisk the egg yolks, sugar, and salt together in a medium bowl until combined. Whisk the cornstarch into the egg mixture until pale yellow and thick, about 30 seconds. Slowly whisk half of the hot cream into the egg mixture to temper, then return the mixture to the saucepan and cook over medium heat, whisking constantly, until thick and glossy, about 1 1/2 minutes. You'll want the mixture to come to a boil. Be sure it is really thick before your take it off the heat. Off the heat, whisk in the butter and vanilla. Transfer the mixture to a small bowl, press plastic wrap directly on the surface, and refrigerate until chilled and set, about 2 hours. Preheat the oven to 350 degrees F. Line the muffin tins with paper liners. Whisk the flour, sugar, baking powder and salt together in a large bowl. With an electric mixer on medium-low speed, beat the butter into the flour mixture, one piece at a time, about 30 seconds. Continue to beat the mixture until it resembles moist crumbs, 1 to 3 minutes. Beat in the eggs, one at a time, until combined, about 30 seconds. Beat in the milk and vanilla, then increase the mixer speed to medium and beat the batter until smooth, light, and fluffy, 1 to 3 minutes. Using an ice cream scoop, portion the batter into each muffin cup. Bake the cupcakes until a toothpick inserted in the center comes out with a few moist crumbs attached, 18 to 20 minutes, rotating the tin halfway through baking. Let the cupcakes cool in the tin for 10 minutes, then transfer them to a wire rack to cool completely. Place all of the ingredients in a microwaveable bowl and microwave the ingredients together at 50% power, whisking often, until melted and smooth, 2 to 4 minutes. ﻿﻿﻿﻿Let the glaze cool, uncovered, until it is thickened but spoonable, about 20 minutes. Spoon the pastry cream into a disposable pastry bag with metal tip. Squeeze the pastry cream into the top of the cupcake. You'll feel the cupcake expand as you squeeze the pastry cream from the bag. Scrape any excess cream off the top of the cupcakes. Spoon the chocolate ganache onto the top of the cupcakes, spreading the topping to the edges. Chill the cupcakes in the refrigerator. The cupcakes are moist, tender, and tasty. The pastry cream is smooth, delicious, and decadent. The chocolate ganache is yummy. Want another cupcake recipe? How about my favorite red velvet cupcakes? Would you like another recipe with a delicious pastry cream? This Berry Trifle is delicious. These look so yummy, wish you did Hme Delivery x LIKE LIKE and LIKE!!! I know what you mean! Actually, you can make these pretty quickly, so give them a try. I think you'll like these, Ana. Each part is finger licking good on its own. Together-yummy! Kristen, I bet he'll be grateful! 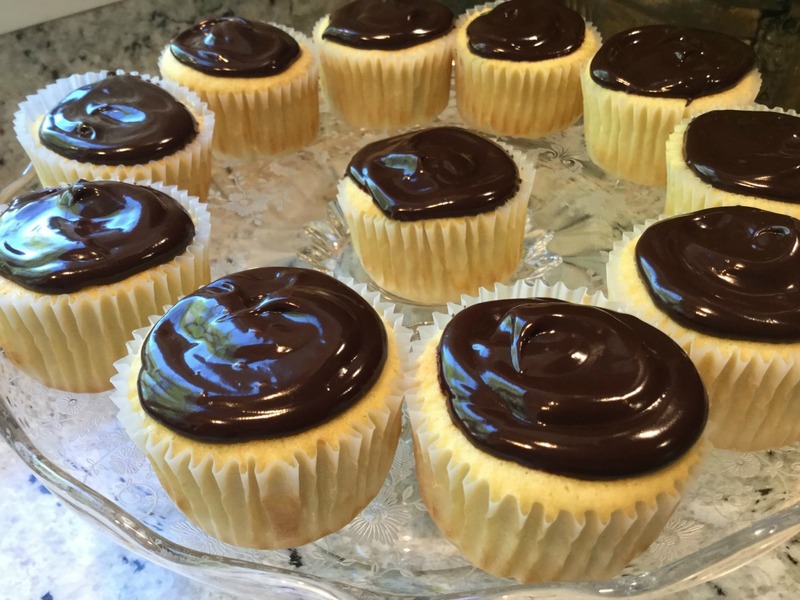 Donna, Boston Cream Pie is one of my favorite desserts. I will definitely try this. Thank you for posting the recipe. These look and sound heavenly. I am also a huge cupcake advocate. A whole cake is too dangerous for me, so cupcakes are perfect. I will have to try this recipe. Pinning for later! I'm with you, Erin. I love how cupcakes allow you to eat a whole cake without the guilt! Thanks very much for the pin, Elizabeth. I hope you'll get a chance to make them soon. What a fabulous recipe! I love Boston Cream Pies. Dropped by from Blogger's Pit Stop, shared and now trying to resist baking. Hope this weekend treats you kindly, Donna. I'm happy that Blogger's Pit Stop helped you find me, Donna. I know what you mean about resisting baking. You can save this for a day when you need a yummy cupcake treat. This is a new recipe to me and it looks and sounds so very yummy. Lucky hubby. It seems that it is a hit with our awesome readers at the Bloggers Pit Stop. Hi Kathleen. This recipe is a hit with my Hubby. Boston cream pie is his favorite dessert. The plus for these cupcakes is portion control.